Click the numbered button above which is the sum of the two dice. Roll the dice, add the scores together to get a total then click on that number at the left of the race track to move the snail forward one step. The first snail to get to the right of the board is the winner (or the snail that has moved the furthest when the teacher calls 'time up'!). Can you predict which snail will win? 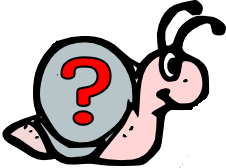 There is also a Teachers' Version of the Snail Race with related resources.